Blue, black, burgundy, green, gray, military green, purple, white. Those were among the colors of the T-shirts of the Junior Fair Horse Show participants taking part in the Delaware County Fair’s 4-H and FFA Horse Parade of Colors on opening day. It’s not long — maybe half an hour — and there aren’t as many entrants as there once was, but the parade is still packed with meaning. 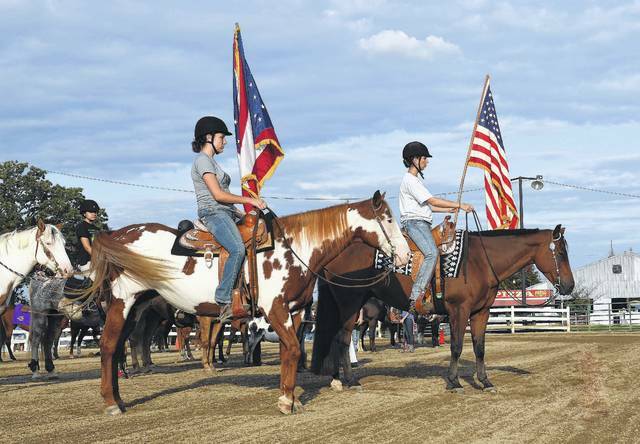 It starts with the American flag brought into the arena on horseback by Grace Smith of Cowboy Convoy 4-H Club and Jocelyn Cardi of Sunbury Halter & Saddle 4-H Club carrying the Ohio state flag. The two riders slowly lead their horses around the arena and stand facing the audience. Then, one by one, each club is introduced, as are the participants, who also take a lap around the arena. Some clubs are newbies, others are veterans, as are the 4-H riders. A moment of silence is held, and a recording of LeAnn Rimes singing the National Anthem is played. The announcer asks the participants to leave the arena in an orderly fashion, and they’ll be having a pizza party in the next hour. Jon Melvin, who is president of the Delaware County Horse Advisors Committee, commented on the significance of the parade. “It’s a labor of love for these guys and there’s no profit,” said Lenny Lepola, a longtime correspondent for The Sunbury News, who was there to snap photos as he does yearly. Lepola said it’s interesting to see if a first-time entrant will stay with it. One young man he thought wouldn’t ended up getting a plaque his first year and went all the way through 4-H. The junior fair horse competition continued Sunday with English classes. The schedule for Monday features Western categories. On Tuesday, rodeo-style events will be showcased, followed by the versatility show on Wednesday, and the open show on Thursday. Each year the Delaware County Fair Junior Fair Horse Show opens with a Saturday evening Parade of Colors. Members of 4-H clubs participating in the five days of equestrian events enter the Junior Fair Equestrian Arena displaying club flags and banners. Leading this year’s parade were Jocelyn Cardi of Sunbury Halter & Saddle 4-H Club, carrying the Ohio state flag, and Grace Smith of Cowboy Convoy 4-H Club, carrying the American flag.